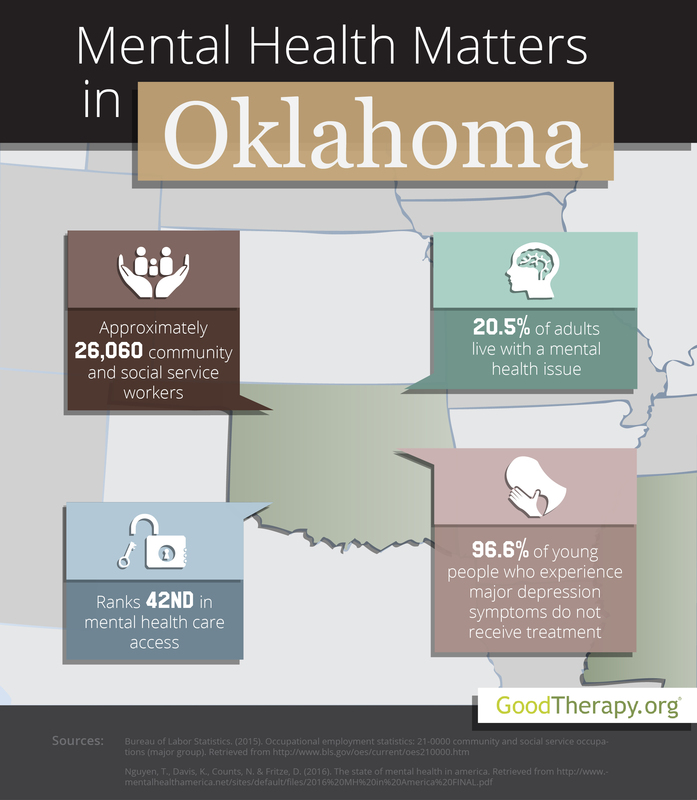 Find a therapist in Oklahoma with GoodTherapy.org. Population data indicates 3.9 million people lived in Oklahoma in 2015. People who were 65 or older made up 14.7% of the state population, while people under age 18 accounted for 24.6%. In 2015, employment statistics indicate 26,060 residents were working in community and social service fields. Typical jobs within this group included licensed social workers, child psychologists, some types of clergy members, community health workers, or a marriage and family therapist. In Oklahoma, therapists and people in related social service fields made an average of $38,280 a year. Mental Health America (MHA) investigates the mental health conditions and access to treatment in the District of Columbia and all 50 states annually. In the 2016 edition of this survey, Oklahoma was given an overall mental health rank of 26th, which falls in the middle of the list. The state was also assessed in a variety of more specific categories; Oklahoma was 40th in the overall adult mental health category, 33rd in the overall youth mental health category, 20th in the occurrence of substance dependence and mental health issues, and 42nd in access to professional mental health treatment. Oklahoma was ranked 46th for adults with mental health issues—with 20.5% of the adult population affected. The state was 26th for adult misuse and dependence on alcohol and drugs; however, Oklahoma was ranked 5th for adolescents with similar substance abuse and dependence issues. With a ratio of 285 residents per mental health provider, Mental Health America gave Oklahoma a 5th-place ranking in mental health workforce availability. This ranking suggests it is easier to find a therapist in Oklahoma than in most other states. The benefits of therapy are also highlighted in a 2014 survey from the Substance Abuse and Mental Health Services Administration (SAMHSA). In this survey, both adult and teenage residents in Oklahoma report improved functioning after receiving treatment. While treatment may be effective, the 2016 MHA survey highlights the difficulty in obtaining this treatment. Oklahoma was ranked 38th for adults with mental health issues who have not been treated by a mental health professional, 44th for adults with disabilities who could not obtain treatment due to cost, 41st for young people with major depression who did not receive any professional care, 41st for young people with major depression who received consistent depression treatment, and 50th for children with insurance that doesn’t cover mental health treatment.